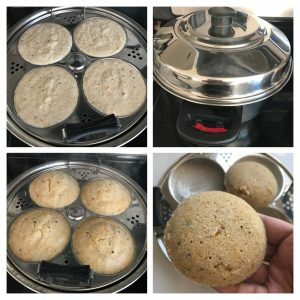 Oats idli is a very healthy and instant recipe which I often make when I get bored of regular idli/ when I am not in mood to make idli/dosa batter. This recipe yields very soft and fluffy idly and is also stomach filling. I am really not a fan of oats but now I am so addicted to it after preparing oats in various forms of course in Indian style as well. This recipe comes handy on days when you run out of idli batter but still crave for idli with healthy twist. This oats idli taste best with any spicy accompany or just a sambar or even a simple chutney powder will do the job. 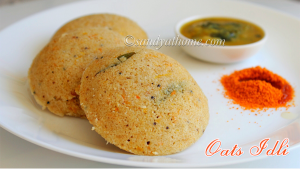 Try this instant oats idli recipe at home and turn your breakfast a healthy and more delicious one. So lets get to the making! 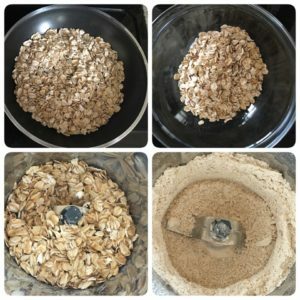 Dry roast oats in a pan. Allow it to cool down and grind it into a fine powder in blender. 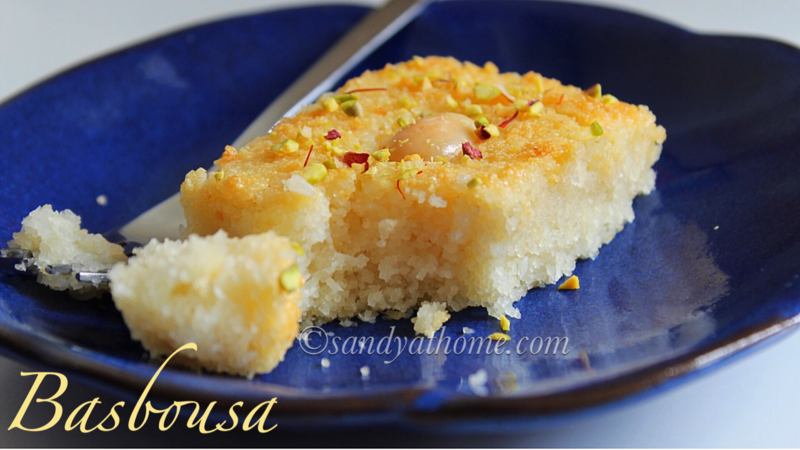 Take a bowl and add ground oats powder, roasted semolina/rava/sooji, salt and curd. Then add water gradually to form thick batter. (I used around 3/4 cup water) Make sure the batter is thick in consistency like regular idli batter. Allow the batter to rest for 10 minutes. Meanwhile heat oil in a pan add mustard seeds, after it splutters, add urad dal when it turns golden brown add curry leaves, chopped green chili and grated carrot. Saute for few second and put off the flame. Allow the mixture to cool down. When the mixture has cooled down add it to the oats batter along with baking soda and mix well. Now heat water in idly pot and grease the idly mold with oil. 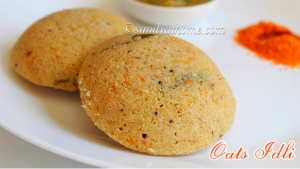 Pour oats idli batter in each mold and steam it for 10 - 12 minutes in idli pot. When done remove it from the idli steamer and allow it to rest for 2 minutes.Then with a with a wet spoon take each idly from the mold and serve it hot with chutney and sambar. 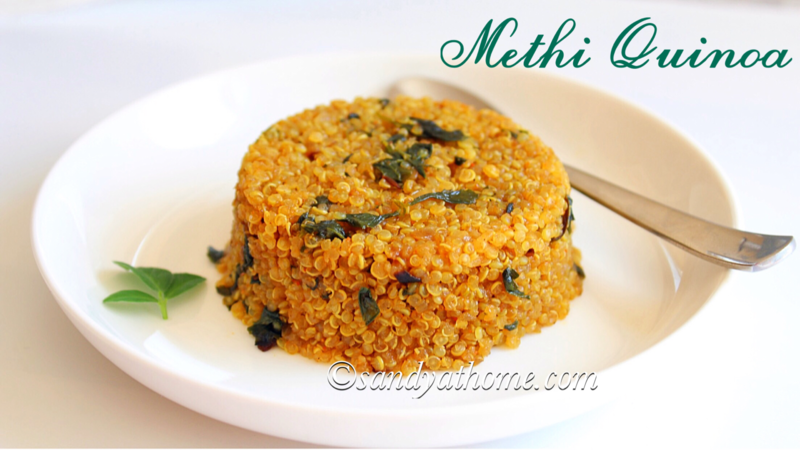 Take a bowl and add ground oats powder, roasted semolina/rava/sooji ,salt and curd. (If using unroasted sooji/rava do roast it in low flame until nice aroma is emitted before use. Make sure not to brown the sooji/rava) Then add water gradually to form thick batter. (I used around 3/4 cup water) Make sure the batter is thick in consistency like regular idli batter. Allow the batter to rest for 10 minutes. Now heat oil in a pan add mustard seeds, after it splutters, add urad dal when it turns golden brown add curry leaves, chopped green chili and grated carrot. Saute for few second and put off the flame. Allow the mixture to cool down. When the mixture has cooled down add it to the oats batter along with baking soda and mix well. Now heat water in idly steamer and grease the idly mold with oil. 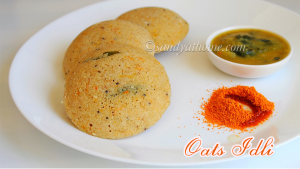 Pour oats idli batter in each mold. and steam it for 10 – 12 minutes in idli pot. When done remove it from the idli steamer and allow it to rest for 2 minutes.Then with a with a wet spoon take each idly from the mold and serve it hot with chutney and sambar. Dry roast oats in low flame without burning them. Make sure the batter is thick which will yield fluffy idli. So add water little by little.